This application has been superseded by ABC Viewer II which is now available for both iPad and iPhone. Scroll down and select Developer Apps to find ABC Viewer II. ABC Session Viewer loads and displays the contents of Paul Hardy's Session Tunebook, ABC format edition. This contains more than 450 tunes. 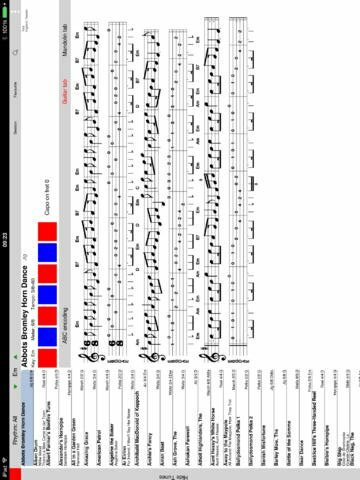 It displays staff notation, guitar tab and mandolin tab. A capo position can be set to adjust the chords and tabs. Also the key of a tune can be changed. ABC Viewer II can be installed without interfering with ABC Session Viewer so you can have both installed on a single iPad.